No matter where you live, there's a good chance that you have Massachusetts roots. Maybe your ancestor crossed the Atlantic on the Mayflower and landed at Plymouth in 1620. More than 10 million people can claim Pilgrim heritage! You may be descended from the original residents of Massachusetts, the Native Americans, or the African slaves who labored here in the 17th and 18th centuries. Maybe your ancestor was among the "Minutemen" who faced the British troops at Lexington on the morning of April 19, 1775, and fired the first shots of the American Revolution. Perhaps your ancestor arrived at Boston harbor from Ireland in the 1840s, escaping the potato famine and hoping for a better life in America. Or your ancestor may have joined countless other immigrants, from all over the world, who passed through Massachusetts or made a home here during the past four centuries. Probably the most important and trustworthy records for growing your family tree are the official birth, marriage and death registrations. No wonder they're called "vital" records! And many early town vital records have been filmed on microfilm or microfiche. At FamilySearch, click on "Catalog," do a "Place-names" search for the town you are seeking, and find a Family History Center near you, where you can order microfilm for review. Another wonderful resource is the Holbrook microfiche, a collection of vital records filmed at Massachusetts town halls, including many volumes not available on microfilm. Here is a complete list. Vital records for more than 200 Massachusetts towns and cities--from the 1600s to about 1850--also have been transcribed and printed in the authoritative "Massachusetts Vital Records to 1850" series (also known as the "Tan Books," for the color of their covers). Most titles begin with "Vital Records of...," and names are arranged in alphabetical order, making research easy. In recent years, a few new books of Massachusetts vital records also have been published--such as David Allen Lambert's Vital Records of Stoughton, Massachusetts, to the End of the Year 1850 (Braintree, Mass. : Mass. Society of Mayflower Descendants, 2008). You can find these books at many libraries. Since most of the old "Tan Book" series is now out of copyright, you can also access many of the volumes on FamilySearch microfilm, or online, at Internet Archive, and Google Books. And the Massachusetts Vital Records Project, has transcribed and indexed 150 of these books by town and surname, and also offers a list of all towns in the series (with other useful data). If you can make a Massachusetts research trip, be sure to visit my favorite library, the New England Historic Genealogical Society (NEHGS), 99-101 Newbury Street, Boston, MA, 888-296-3447. Here you can find the "Tan Books," Holbrook microfiche, town records microfilm and MANY other resources, including manuscript records for "unpublished" towns, and the most extensive databases of Massachusetts vital records available anywhere. For anyone researching early ancestors in western Massachusetts, where many of the towns have no printed vital records, the massive Corbin Collection is a not-to-be-missed resource. The original manuscripts and microfilm are available at NEHGS--transcriptions by genealogists Walter and Lottie Corbin of vital records, gravestones, town records, etc. for Hampshire, Hampden, Berkshire and Franklin Counties. The collection is also available as a searchable CD-ROM. Check Picton Press, for more details. Since 1841, Massachusetts towns have sent summaries of birth, marriage and death records to the state. Thus, for vital records from 1841 to 1920, you can request copies of records or certificates either from the town clerk, or from the Massachusetts Archives, 220 Morrissey Blvd., Boston, MA 02125, 617-727-2816. The Archives has the 1841-1920 registration books and indexes (originals and microfilm), and an online index for records from 1841 to 1910. The birth, marriage and death books, 1841 to 1915, also are available as searchable digital images online at FamilySearch. The 1916-1920 books are currently being digitized, and FamilySearch is in the process of publishing them online. 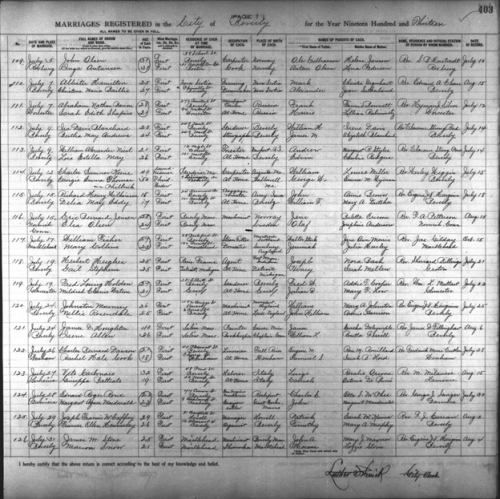 Massachusetts Vital Records, Marriages, Vol. 618, p. 403. City of Beverly, 1913. Massachusetts vital records from 1921 to the present are available from town clerk, or from the Registry of Vital Records and Statistics, 150 Mt. Vernon St., Dorchester, MA 02125, 617-740-2600. The Registry will do a ten-year search (for a fee) if you do not know the date or place, and issue certificates. If you want to do your own research, you can review indexes and records at the Registry research room. The New England Historic Genealogical Society also has indexes--births to 1950, marriages to 1970 (except for 1956-1965), and deaths to 1980. Court records are my favorite genealogical resource--not surprising, since I started my career as an attorney! Probate records, such as wills, often list names of family members, linking generations in your tree. 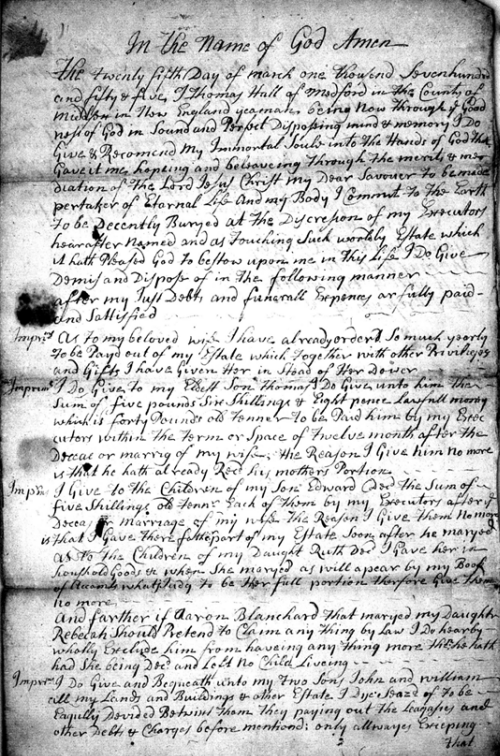 Will of Thomas Hall, Medford, Massachusetts, 1757, Middlesex County Probate Files, #10184. And other kinds of court records--lawsuits, bankruptcy, naturalization, etc.--can be just as valuable, sometimes the only proof of family relationships and origins. In my recent research for a client seeking Mayflower Society membership, for example, 18th-century court records turned out to be the key evidence documenting one of his elusive ancestors. 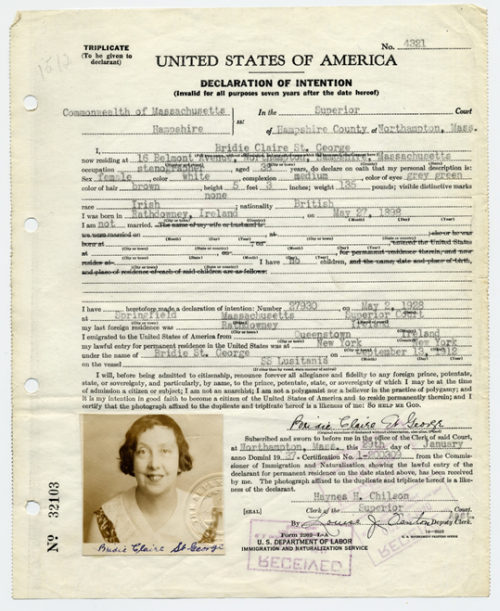 Naturalization Record (Declaration of Intention) of Bridie Claire St. George, 1937. Hampshire County Superior Court, Massachusetts, Vol. 37, p. 22. 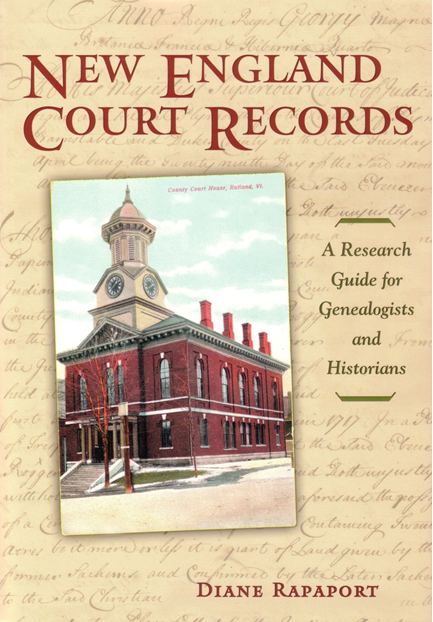 My first book, New England Court Records: A Research Guide for Genealogists and Historians (2006), tells how to find and use Massachusetts court records from the 17th to 21st centuries, in hundreds of sources--courthouses, archives, books, microfilm, CDs and websites. Many original Massachusetts court records can be found at the state's Judicial Archives, which shares space with the Massachusetts Archives. Check this page, or write to Elizabeth Bouvier, Head of Archives, Judicial Archives, 3 Pemberton Square HighRise, 16th Floor, Boston, MA 02108. 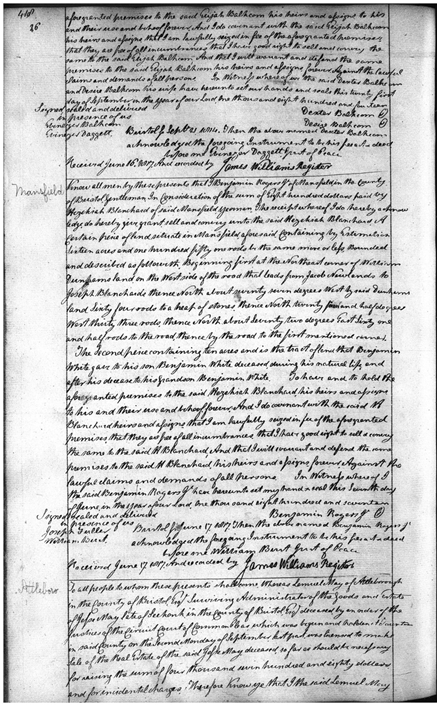 For records of the Massachusetts federal courts, including bankruptcy and naturalization, contact the National Archives at Waltham, Massachusetts. Check the FamilySearch catalog (do a "Place-names" search for the Massachusetts county you are interested in), to find microfilmed court records, available at many archives and libraries, as well as through Family History Centers. My New England Court Records book also lists microfilm titles. 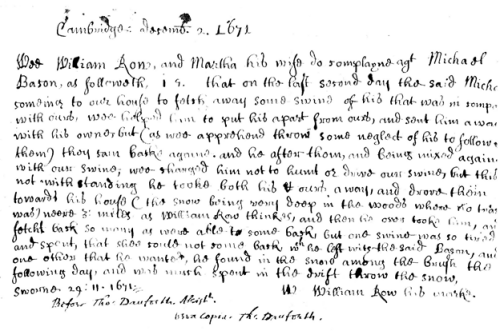 Complaint, "William Row and Martha his wife" v. Michael Bacon, 2 Dec 1671. Middlesex County Court Folio Collection, 2, 59-2. Records and Files of the Quarterly Courts of Essex County, Massachusetts, 9 vols. (Salem, Mass. : The Essex Institute, 1911-1921). Also at Salem Witch Trials Documentary Archives and Transcription Project. Records of the Colony of New Plymouth in New England, 12 vols. (Boston: Press of William White, 1855-1861). 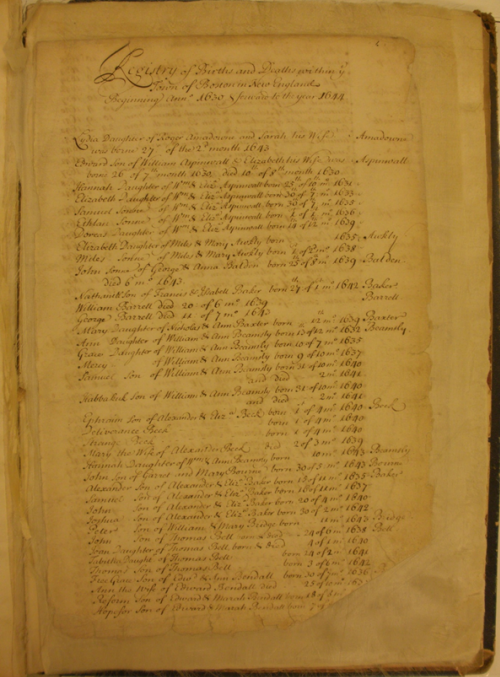 Land records are an underutilized but valuable resource for Massachusetts researchers. Deeds often mention wives, children and other relatives, or provide details about the land-buyer's origins and occupation. Look for the grantor/grantee indexes and deed books at the county Registry of Deeds offices. It can be a thrill paging through original handwritten volumes--I often review Middlesex County deed books from the 1600s at the registry in Cambridge, Massachusetts--but you can find these records on microfilm, too. (Do a "Place-names" search by county at the FamilySearch catalog.) Many of the registry offices have microfilm and digitized records, and some offer indexes and images online. And a few transcribed deed books, like the 14 volumes of 17th-century Suffolk Deeds (Boston: Rockwell & Churchill, 1880-1906), can be found in libraries and at Internet Archive and Google Books. Bristol County, Massachusetts Deeds, Vol. 102, p. 418. I hope that these tips will help you find authoritative primary source records about your Massachusetts ancestors. And here are a few more ideas, of resources and places to look. Good luck with your research!